The next generation EVGA X99 motherboard lineup has been unleashed, featuring three new motherboards for Intel’s latest Haswell-E processors. 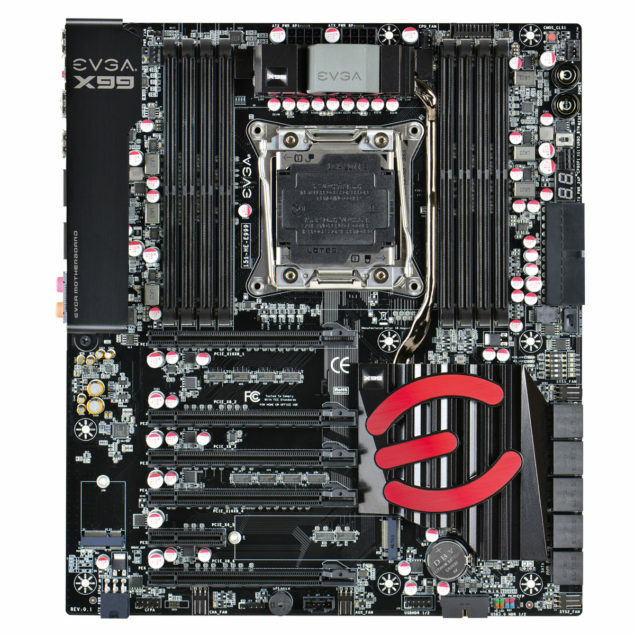 The EVGA X99 motherboards are based on the new platform design which is capable of supporting the latest Haswell-E processors and DDR4 memory to meet the performance demands of current day overclockers and enthusiasts. The EVGA X99 FTW features a black color scheme followed by a large “E” logo on the PCH heatsink which is colored red and several expansion slots which are red colored too. The X99 FTW is another top tier motherboard featuring a 10 Phase PWM supply which is fed power through a 8-Pin connector and a 24-Pin right angled connector which powers the rest of the board. The LGA 2011-3 socket is surrounded by eight DDR4 DIMM slots (four at each side) which support DDR4 memory sticks like the new ones displayed by Corsair, Crucial, Kingston, G.Skill and ADATA featuring low voltages, up to 128 GB capacities and higher clock frequencies. Right next to the DIMMs, we can spot voltage check points, a Diagnostic LED, a few On/Off and rest switches. Storage options include 10 SATA 6GBps ports and a single USB 3.0 and USB 2.0 port on the bottom of the PCB. Expansion slots include five PCI-e 3.0 x16 slots and a single PCI-e 3.0 x4 slot.No mSATA slots can be spotted on FTW and even the audio layout is the standard one. A right angled 6-Pin connector is located at the bottom left corner to provided additional juice to the expansion slots when using multiple cards since the board is capable of supporting 4-Way SLI and CrossFire Multi-GPU functionality. Finally, we have the I/O panel which includes 6 USB 2.0, 4 USB 3.0, a CMOS header, two Gigabit Ethernet LAN ports and a 7.1 Channel audio jack. The EVGA X99 FTW motherboard features the LGA 2011-3 socket just like the other two boards in EVGA’s line to support Intel’s Haswell-E processors which will be shipping to consumer at the end of this month. The EVGA X99 Classified features a black color scheme followed by a large “E” logo on the PCH heatsink which is colored red. The X99 Classified is EVGA’s top tier motherboard featuring a 10 Phase PWM supply which is fed power through a 8-Pin connector and a 24-Pin right angled connector which powers the rest of the board. The LGA 2011-3 socket is surrounded by eight DDR4 DIMM slots (four at each side) which support DDR4 memory sticks like the new ones displayed by Corsair, Crucial, Kingston, G.Skill and ADATA featuring low voltages and higher clock frequencies. Right next to the DIMMs, we can spot voltage check points, a Diagnostic LED, a few On/Off and rest switches. Storage options include 10 SATA 6GBps ports and a single USB 3.0 and USB 2.0 port on the bottom of the PCB. Expansion slots include five PCI-e 3.0 x16 slots and a single PCI-e 3.0 x4 slot. Two mSATA slots are located to the right and left of the x4 slot. One is positioned down the isolated audio PCB which is powered by the Creative Core 3D chipset and ALC 1150 codec. A right angled 6-Pin connector is located at the bottom left corner to provided additional juice to the expansion slots when using multiple cards since the board is capable of supporting 4-Way SLI and CrossFire Multi-GPU functionality. Finally, we have the I/O panel which includes 6 USB 2.0, 4 USB 3.0, a CMOS header, two Gigabit Ethernet LAN ports and a 7.1 Channel audio jack. The EVGA X99 Micro is a a M-ATX motherboard and to be honest, a lot of users have been waiting to see M-ATX motherboards in the X99 lineup. This along with the upcoming ASRock X99M Killer FATAL1TY are the few of the M-ATX offerings you will receive in the X99 motherboard lines. Featuring the LGA 2011-3 socket to support Intel’s Haswell-E processors, the X99 Micro features a 10 Phase PWM powered by a 8-Pin connector and a 24-Pin power connector to provide juice to the rest of the board. The X99 PCH is hidden beneath the black heatsink while a single heatsink cools down the VRM area. Four DDR4 DIMM slots provide support for up to 64 GB of memory which is enough for usage until you want to go the workstation route. Storage includes 6 SATA 6 GBps ports along with a USB 3.0 and USB 2.0 header on the bottom of the board. Expansion slots include three PCI-e 3.0 x16 and a single mSATA slot to support NGFF SSDs. The motherboard keeps things simple with its design. We can spots 3 x 2 phases on the sides of the DIMMs while the I/O include 6 USB 2.0, 4 USB 3.0, a single Gigabit Ethernet LAN port and a 7.1 channel audio jack.